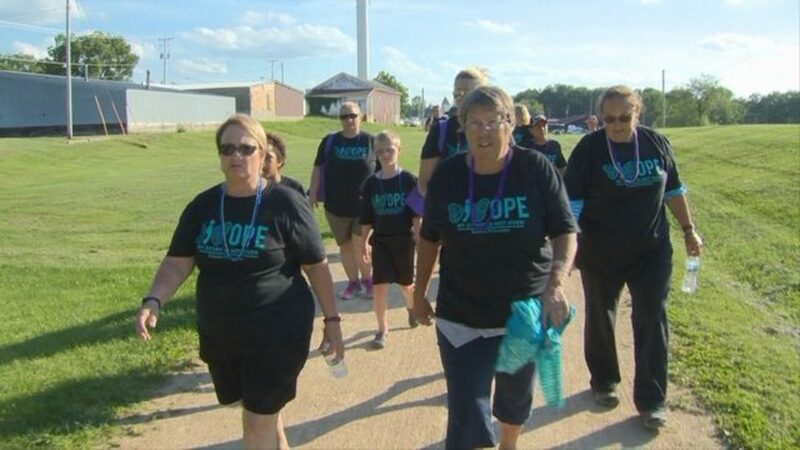 RIDGEWAY, Wis. - With studies showing rural areas are hit the hardest by America's suicide epidemic, an Iowa County memorial walk held on Tuesday aimed to start conversations. The Iowa County Suicide Memorial Walk, held in Ridgeway, featured a butterfly release in honor of those who lost their lives to suicide and a fundraiser for the Suicide Prevention Coalition of Iowa County, which sponsored the event. A study, released in March by the Centers for Disease Control and Prevention, shows that America's suicide rates are on the rise and rural areas account for the highest rate of suicides in the country. The impact is felt in communities throughout southwest Wisconsin. Susan Sawle of Ridgeway lost her brother, Jeff, to suicide last November. "My brother suffered with depression," Sawle said. "I remember how he said my name. I don't know why, but that's what I remember the most." Phil Henneman of Boscobel lost his son, Heath, to suicide 11 years ago. "I would have never said 'I would have had suicide (in my family)' and he did complete suicide," Henneman said. Sawle said a lack of resources played a role in her brother's death. "There's no help out here in the rural community," Sawle said. Indeed, organizer Susan Springer Judd, who founded the Suicide Prevention Coalition of Iowa County, said many in rural areas feel isolated and are unable to access the kind of mental health resources that people in urban areas can. She said suicide has a particular impact on farmers, who have the highest suicide rates of any occupation nationwide. Dairy farmers are especially affected. "If you're a dairy farmer, which is what Wisconsin's known for, you're six times (more likely) to die by suicide," Springer Judd said. Springer Judd said many farmers feel isolated and feel like they have to live up to expectations "staying tough." Farmers are expected to be "tough and strong and able to handle (their) problems," Springer Judd said. She said farmers are often conditioned to think "nobody needs to know outside of the family." The goal of the memorial walk is to change those stigmas and get people talking about the issue of suicide in rural Wisconsin. "If they don't talk about it, they feel there's no hope and that's what happens," Sawle said. "I want to get it out there that if you have problems or anything, you need to get somewhere and talk to somebody about it." If you are struggling with suicidal thoughts, help is just a phone call away. Call the National Suicide Hotline at 1-800-273-8255 or text 839863. To learn more about the Suicide Prevention Coalition of Iowa County, visit its website.